Formally known as Mactan-Cebu International Airport, is the airport destination of Tutubi about 10 years ago and has since become his most visited place outside Luzon. Herewith is a Guide to Mactan Cebu International Airport based on accumulated "wisdom" of Tutubi, thus these tips and other information for the traveller. Cebu City is the second largest and busiest airport in the Philippines, there are many direct flights to most domestic destinations plus several international flights. Coupon taxis are available at the arrival area gates with fixed taxi fare listed on a fare matrix. Yellow metered taxis are also available with PhP70.00 flagdown rate to any destination in Cebu. 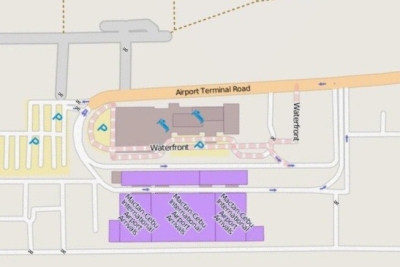 Metered taxis can be flagged down by arriving passengers at the departure area. To get regular taxis, cross the street from the arrival area gate. A little to your right is a short stairway that leads to the departure area where metered taxis drop off departing passengers. Travel time from cebu Airport to Cebu City center and downtown area is just around 30 minutes, taxi fare is around PhP200.00 to PhP300.00. Taxi drivers here are less notorious than the taxi drivers of Metro Manila. At the domestic departure area there's only one restaurant/eatery serving full rice meals (Cafe Wien) but it closes at 7pm (Tutubi learned this the hard way). For snacks, there's Fruit Magic (with teeny-weeny sandwich and pasta), Dunkin Donuts, and Coffee dream and several snack counters and pasalubong stores. Duty free shops at the international departure area. Wishing to commute to Cebu Airport rather than take a cab? at the City center take multicabs going to Opon then drop of at Marina Mall. At Marina Mall look for with yellow multicabs with signboard Lapu-lapu City to Airport (LLC-PUBMARKET-MCIAA-VV). At the arrival area, walk towards Airport Terminal road and look for the same yellow multicabs going to marina Mall then transfer to another multicab to your destination (e.g. SM Cebu, Ayala Center, Mandaue et al). From Cebu City onwards, suggest you go to SM City Cebu then ride jeepneys, multicabs or vhires (vans/fx) as it's a public transporation hub with lots of terminals. You can also proceed to Cebu North Bus Terminal (e.g. for bus trips to Bogo, Bantayan Island or Malapascua Island) or Cebu South Bus Terminal (e.g. Moalboal) to catch buses to your destination. From the aiport, ride the multicab to Marina Mall, transfer to a multicab going to Mandaue. In Mandaue, ride the jeep to One Citilink. At One Citilink, take vans going to Moalboal. very helpful, as always! thank you! Where is the best place to stay in Cebu? Hi. How much does the yellow multicabs charge from the airport to the marina mall? for backpackers its fun to commute..so you'll be able to tour around more cebu.. but then when you have luggage on wheels..just take a cab to your hotel , leave your things and when touring around..take jeepneys rather than cabs.. so you'll get to see more view ;) thats what i do when i travel to a place..
Hi how much is the fare to a taxi from South Bus Terminal to Mactan-Cebu International Airport? Have times changed ... the taxi drivers are just as horrendous as in Manila now. We got cheated 4 out of 5 times we took a cab in the week that we were there. Arrive at the airport well in advance of your flight time. Check with the carrier since each airline bases its time recommendation independently on estimated travel flow for any particular day. You should be wary of thieves. From the time you land at the airport, you have to secure all of your belongings. Never keep them out of your sight. Just about to end my Cebu trip. I must say the cabs here are probably the cheapest and most honest throughout Asia. So far every driver has switched on the meter without asking and they dont try to take some yoyo route. Cant believe that someone got cheated 4 out of 5 times, maybe cause you are Caucasian?